If a student wanted to start a research paper on subjective well being if could began: Subjective well being is a scientific concept which psychologists and other specialists use to assist individuals in assessing their lives. Although the concept may at first appear to be synonymous with happiness, subjective well being is an umbrella term that may encompass elements such as joy, self-esteem, and fulfillment. It is actually comprised of two distinct but often interconnected constituents: an affective or emotional component that concerns the presence of positive (and the absence of negative) feelings, and a cognitive component that self-appraises how one’s life is matching up to one’s expectations and ambitions. It is “subjective” because it is the individual who assesses herself and decides the relative weight given to diverse elements of subjective well being. The concept originally emerged from humanistic and positive psychology, subfields that worked to elevate psychology from its traditional heavy focus on mood disorders such as depression, anxiety, and other negative emotional states. In time, psychologists of diverse persuasions came to agree that clients’ self-reports on how well their lives are progressing can provide vital information about their underlying emotional states and about where support and counseling might be most helpful. Subjective well being is an especially beneficial concept because it may be used to assess one’s evolving feeling about what is occurring in one’s life, to assess specific domains of one’s life such as marriage or work, or to assess one’s life in more global terms like general fulfillment and life satisfaction. What is a Need? - Starting from the base of the pyramid with physiological needs to be able to move to the upper needs of safety, social, self-esteem and finally self- actualization. 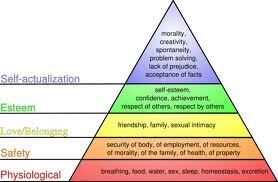 Maslow’s Hierarchy of Needs research papers discuss Maslow's theory in light of employee motivation. Paper Masters writes custom research papers on Subjective Well Being and discuss the scientific concept which psychologists and other specialists use to assist individuals in assessing their lives.